Our launch event for the apologetics program Flashpoint 2012 (http://www.flashpoint2012.com/) was a major success, thanks in large part to friends like Todd and Terry with RR. Having Mark Hitchcock speak, along with Dr. Thomas Sharp of Creation Truth Foundation, was spectacular. Both these men have a heart for people and boldness in their speaking that is too rare in our day. Mark’s talk on the 2012 phenomenon, highlighted in his terrific book, 2012, The Bible, and the End of the World, was itself phenomenal. I spoke on a topic based on our new Balfour Books title, The Palestinian Right to Israel. There isn’t one, of course, but the point I was making is that perhaps the chief issue in our world hurtling us all to an apocalyptic conclusion is the Palestinian-Israeli crisis. It is a crisis, and more specifically, a true flashpoint for the sequence of end-times events to unfold. An important historical point that many are not aware of is that the Palestinian Arabs of a half-century ago were almost as radicalized as they are today (thanks to the satanic efforts of the Egyptian-born Yasser Arafat). During World War II, while Hitler was fighting on multiple fronts and monitoring 1,000 things a day, he found the time to engage with Haj Amin al-Husseini, the grand mufti of Jerusalem. Husseini, an Arab possessed (pun intended) with a blind hatred of the Jews, traveled to Berlin for high-level meetings with Hitler and other Nazi bigwigs planning the Final Solution to the Jewish question. Husseini’s offer to help organize Muslim brigades in the German Army was met with enthusiasm by Hitler, whose weird obsession with the “racially pure” Aryans led him to believe that Husseini, who possessed from fair-skinned features of the “Master Race,” was in fact connected to Aryan stock in some way. One wonders how in the world such a collection of weirdos, political hacks, and social nerds brought the world to the brink. Today, the Palestinians are still stuck in a primitive, tribal mindset in which they believe that territory conquered under the banner of Islam is Allah’s permanent possession. There is considerable debate over the question of whether Muslim terrorists are driven more by Marxist ideology — in other words, political Islam — or whether they are driven by a mystical, religious fervor still swirling in the sands of seventh century Arabia. Is this a war of religion or naked totalitarianism? Surely one of the most successful Arab strategies involves the decades-long emphasis on repetitive nothingness. What I mean by that is, they resolve to negotiate a final peace deal with the Israelis and this causes Socialist Europe and the leftist West to giggle with childish delight. Then the rug is pulled out when the Arabs refuse a final peace deal based on a seemingly small point, such as a single-digit percent of land swap in Judea-Samaria. Politically skilled folks like Bill Clinton have been flummoxed by this Palestinian rope-a-dope strategy for years, believing the latter are genuine peace partners to begin with. They are not. 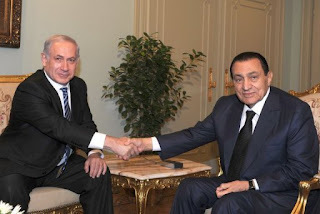 This week, Egypt’s foreign minister expressed pessimism concerning the meeting with Benjamin Netanyahu and Hosni Mubarak (by the way, have you noticed that no Muslim leader will deign to visit Jerusalem? Anwar Sadat got shot full of holes for his single visit 33 years ago). It was felt that the basis for negotiations between Israel and the Palestinians lacked the necessary commitment. What this means of course, is that the Jews are once again being obstinate and not giving the Palestinians what they need for a state. Even Clinton — no real friend of Israel despite his cornpone, grinning demeanor with pliable Israeli leaders like Ehud Barak, who was prepared to give Arafat 95 percent of his official demands — understood quite clearly what the wily Arafat was up to. He had no intention of making peace with the Jewish state. I can tell you that the participation of U.S. special envoy George Mitchell in the talks between Mubarak, Netanyahu, and PA Chairman Mahmoud Abbas has the odd feel of a complete, but dangerous waste of time. Mitchell, the former senator from Maine, is hardly a friend of Israel. Each of us is shaped by our background. Mitchell, whose mother was a Lebanese immigrant, and whose father was adopted by a Lebanese family, is a Maronite Catholic and considered to be a prominent Arab-American. He also worked in counter-intelligence in the U.S. Army, so I suspect his toothy grin masks a bit more sinister core that serves him well in his “mediation” between Arabs and Israelis. Do you think in his heart of hearts that he has Israel’s best interests on the table? Israel has so many obstacles in front of her regarding co-existing with the Palestinian Arabs that one wonders how the breath-taking array of forces can be defeated. For insight into that, read the Bible, particularly Psalm 83, Zechariah, and Isaiah and Jeremiah. The next few months will be fascinating to watch unfold, as Netanyahu juggles the Iranian threat and their psychotic dwarf, against the constant Palestinian crisis. As I said in my presentation Saturday, the Arabs are relentless in their pursuit of a Jew-free Middle East. This one issue presents the single greatest flashpoint in our world today.